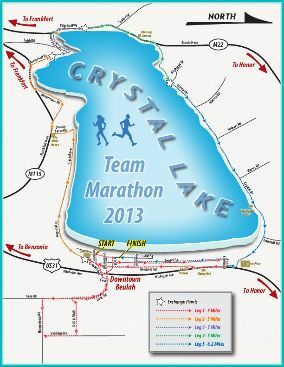 Sponsored By: Crystal Lake Business/Community Association and SMELTZER ORCHARD CO. Distance: First four team members run 5 miles each. Fifth team member runs 6.2 miles. Plaques will be awarded to the 1st, 2nd, and 3rd place teams in all three categories. All other prize- winning teams will receive medals and a team member or representative MUST be pre-sent at the awards ceremony to receive these awards. Awards may be picked up at the Ben-zie County Chamber of Commerce from 8/13 to 8/20. The top three family teams will receive a special award. 5 members per team, and all must be related by birth or marriage.